Ancient beauty meets high-tech in this functional, decorative, and comfortable MouseRug®. 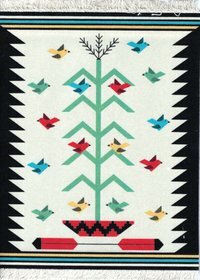 This design represents the Burham style Navajo rug developed by the Barber and Begay families in the 1980's, in which the well known Two Grey Hills style was combined with colorful pictorial elements. The original Navajo Weaver of this desgin, Bessie Barber. Credit: The Gloria F. Ross Collection of the Denver Art Museum. Finely-detailed and intensely-colored this MouseRug® is printed without ink—using only pre-dyed nylon fibers and water based adhesive which are combined with high voltage electricity and screen printing. Made in the USA, hand-washing recommended. Ancient beauty meets high-tech in this functional, decorative, and comfortable MouseRug®. This design was inspired by handwoven Indian flatweave rug designs from the American Southwest. 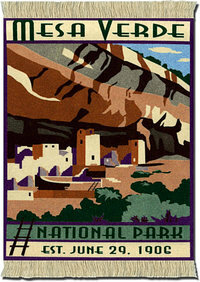 This functional, decorative, and comfortable MouseRug® features the towers of Cliff Palace and artwork commisioned for the 2006 Mesa Verde National Park Centennial. Inspired by handwoven Navajo rugs featuring the Tree of Life. Portrayed is a picture of a corn stalk sprouting from a wedding basket surrounded by birds. These images represent movement and progression throughout life, as well as the connections between the Navajo people, the Earth, and the universe.